Mataro Blue CBD by Kannabia combines all the therapeutic benefits of cannabidiol with a mild recreational buzz. Plus, she's high yielding and beginner friendly, too. Let's see how she grows. Kannabia Seeds recognised there was an underserved segment of the cannabis community that wanted a functional high to go along with their medicine, and they answered that demand with Mataro Blue CBD. And, get this: She's a beginner-friendly beauty that pumps out mass quantities of big, crystal-coated flowers even if you make every mistake in the book. Want to know more? Read on, my friend! As mentioned, Mataro Blue CBD is easy to grow and she takes all kinds of stress in stride including overfeeding, underfeeding and temperature fluctuations. She responds well to just about any training method, but you'll get the highest yields by going with SOG, flipping to a 12/12 bloom period early on and using at least 600 watts of light. To start indoors, place your seeds directly into root cubes, cover with a humidity dome and place on a warm heat mat under indirect lighting. After five to seven days, you should see the cotyledons emerge from the cube with a visible tap root pushing through the bottom. At this point, it's safe to put them in your final medium or you can wait up to another week to allow the roots to develop a bit more. Many high-CBD phenotypes prefer to be fed lightly, so go easy on the nutrients at first until you see how your new plants handle your mix. If you have time to prepare beforehand, an organic super soil will take a lot of the guesswork and effort out of feeding. As the root system develops, Mataro Blue CBD quickly shoots out new side branches and plenty of shiny, dark-green fan leaves. They'll look short and bushy during this stage, but you should move from veg to bloom when your young plants are about half their target size because they can easily double their height during the first few weeks of 12/12. At this time, you should add a support system to prevent the branches from bending away from the lights or actually breaking under the weight as the buds develop. By the end of the second week of finish, you'll start to see fluffy masses of white hairs growing from each node quickly followed by visible flowers. Around week five, the buds will feel heavy in your hand and even the sugar leaves will be coated in so many THC crystals that you can easily pick them out with your naked eye. From there, everything will continue to fatten and dense up until your plants are ready to cut around the 60-day mark. For maximum eye-appeal, drop your temps during dark periods; cold air brings out the richest hues in this strain. That won't affect the power rating, but it will add a little eye-candy to your grow room. Who doesn't like that? Mataro Blue CBD will be literally covered in dense, sticky blooms by harvest time, with colours that range from light green to purple to a bluish tint. 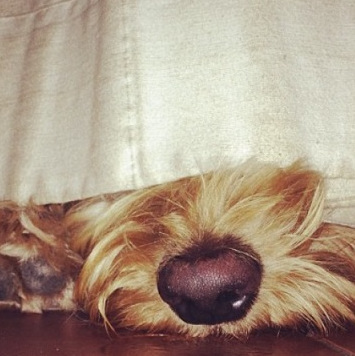 With adequate lighting, popcorn and fluff will be minimal, but don't let anything go to waste. Everything, including the trim, can be turned into oil or extract. With heavy Kush and Blueberry influences, Mataro Blue CBD blends a classic earthy taste with a moderate amount of sweetness and just a kiss of berry flavour that you might not notice if you're not expecting it. It's not the most exotic flavour, but overall, it's smooth and rich as long as the buds are well-cured. The fragrance is strong, but not overly pungent, with an aged wood quality similar to the oak casks used to hold the fine wines that made the Mataro region of Spain famous centuries ago. Mataro Blue CBD is Kannabia Seeds' answer to a special segment of the cannabis community that wants to have their cake and eat it too. And, why not when you can? The lowered 10% THC level and Indica-dominant genetics give you a noticeable stone that won't turn you into a couch-locked zombie while the increased 7% CBD delivers all the therapeutic benefits everyone's talking about for a soothing physical sensation that numbs pain, reduces inflammation, eases stress and allows you to rest peacefully at night. This strain does stimulate the appetite slightly; that's good for some and not so good for others. 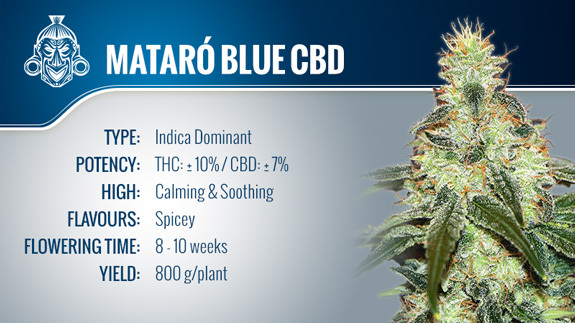 If you want to combine a mild buzz with medicinal value, Mataro Blue CBD is one of the best choices available today. She's easy to grow, has large yields indoors or out, and even has knockout good looks. Put her at the top of your wish list for the next time you need a new high-CBD strain for your garden!